South Korea's Jiyai Shin struck a brilliant eight-under-par 64 to open up a five-shot lead after two rounds of the Women's British Open at Hoylake. With round two restarted on Saturday after Friday's high winds, the former world number one moved to nine under. 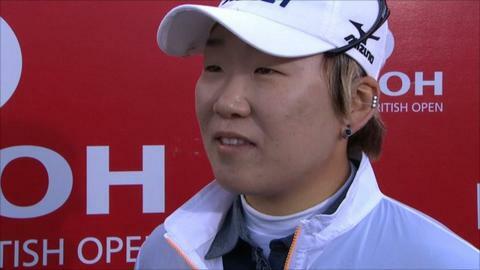 Compatriot Inbee Park lies second, with Australian Karrie Webb and Japan's Mika Miyazato both on three under. Both the third and fourth rounds are scheduled to be completed on Sunday at the Royal Liverpool course. Shin's round was four shots better than any other in the tournament so far. The 24-year-old, who won a nine-hole play-off against Paula Creamer in Virginia on Monday, said: "I think it's the best round I've ever played. "I had nine under there [in Virginia], but it was soft greens and fairways and easy to hit it aggressive. This is a totally different golf course. "My goal was one under every single day, so eight under - wow. I can't believe it." All three of this year's previous three majors have been won by players from Asia, with five players from the continent occupying the top 10 at Hoylake and world number one Yani Tseng from Taipei tied for 11th on level par. Sweden's Carin Koch, on one under, is the leading European, while England's Holly Clyburn, tied for 17th on one over, is the top amateur. Fellow Englishwoman Laura Davies, now 48 and playing in her 100th major, was already 10 over when she withdrew with an ankle injury 10 holes into her second round.